Home > News > Commencement 2018 -- Congratulations Graduates! Commencement 2018 – Congratulations Graduates! 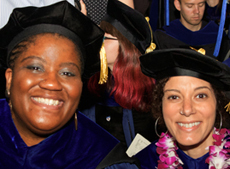 The African American Studies Department happily congratulates our outstanding graduates and degree recipients in 2018! Read more about our outstanding graduates who were honored during Black Graduation (May 19) and the Graduate School of Arts and Sciences degree ceremonies (May 21).